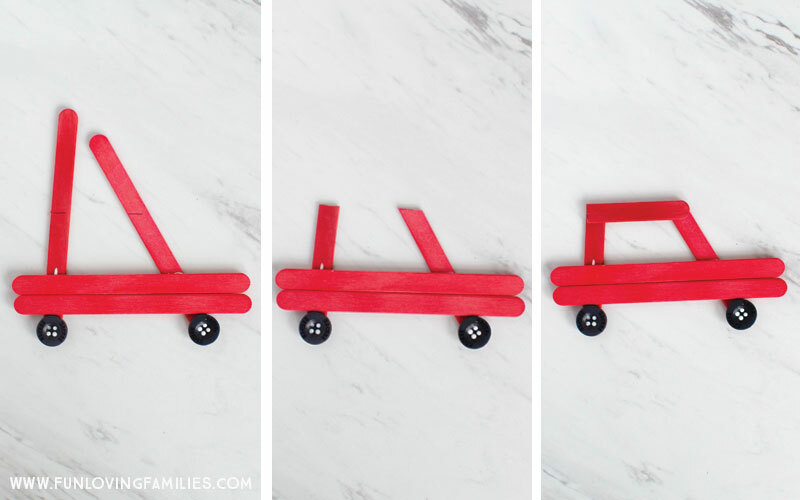 These adorable car and truck Popsicle stick Christmas ornaments couldn’t be easier to put together with a few inexpensive supplies. 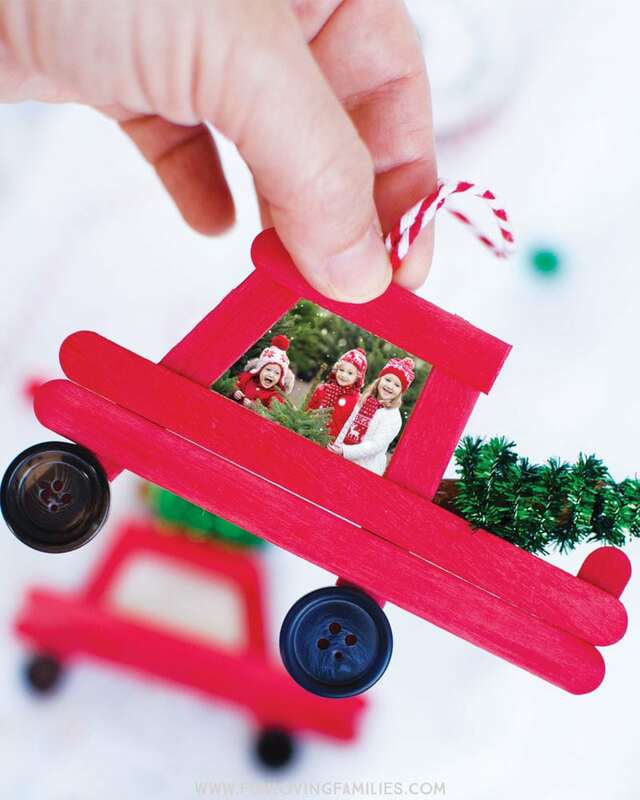 The ornaments also make great photo frames for your family holiday portraits! We’re just a couple weeks away from Thanksgiving now, and we finally have our plans for the holiday. Thanksgiving day will be pretty low-key with just the usual parade-watching and feasting. Then, we’ll spend the next day driving into the mountains to go to a cut-your-own Christmas tree farm. We moved to North Carolina from Florida about 5 years ago, and it’s something I’ve always wanted to do with the kids. I couldn’t be more excited. And, I’m hoping we can go ahead and snap some family photos to use for our Christmas cards this year. I love seeing cars and trucks driving down the road with their trees strapped to the hood. It’s so exciting, and the imagery really gets me into the holiday spirit. 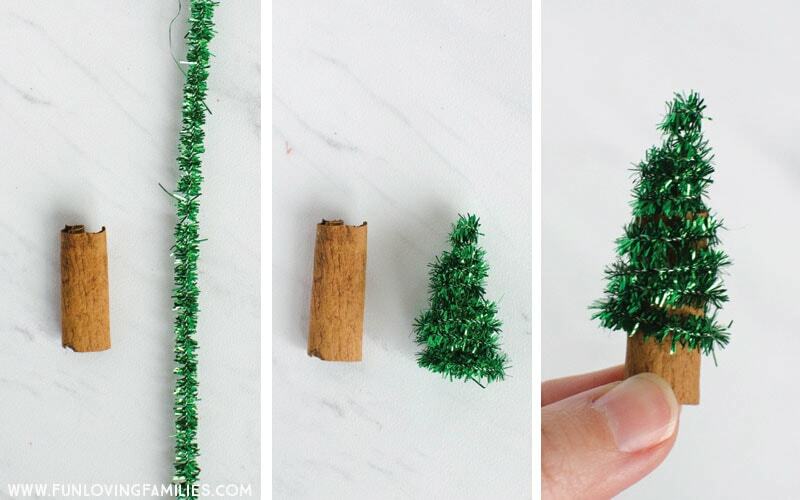 Popsicle stick ornaments are so easy to make, and you usually only need a few simple items. 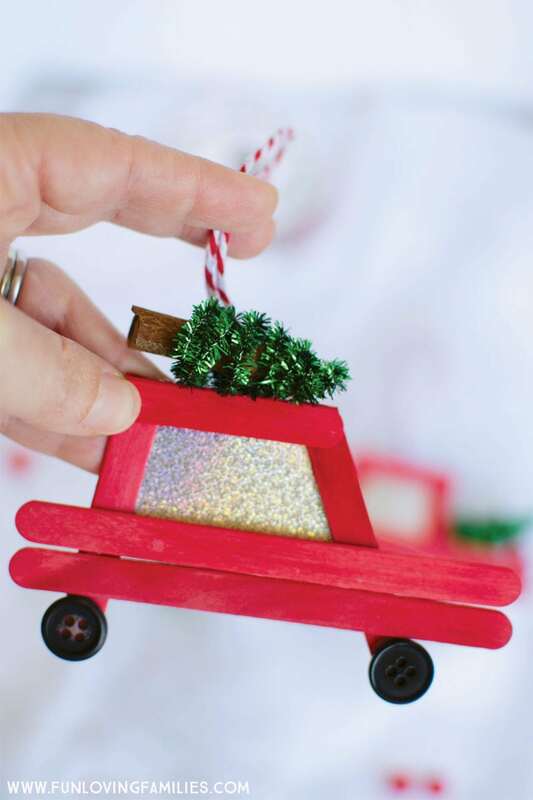 Most of the items you need to make the Christmas car and truck ornaments can be found at the Dollar Tree. 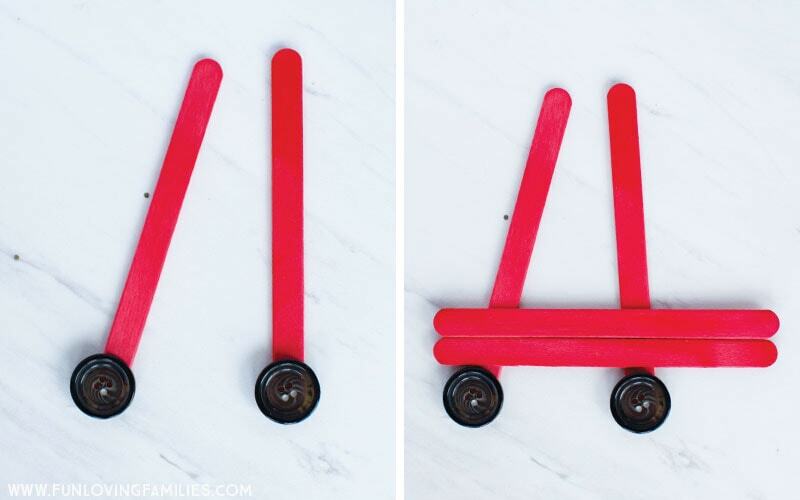 Use regular school glue or hot glue to attach small black buttons to the bottoms of two popsicle sticks. 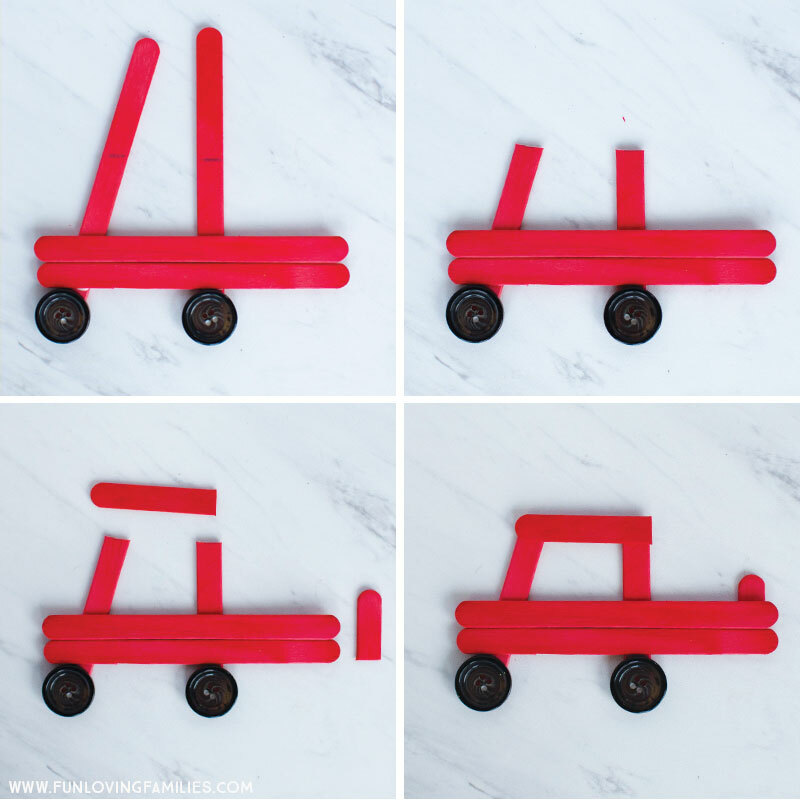 Refer to the images below to see how the base popsicle sticks are positioned. Glue two popsicle sticks horizontally above the buttons, as shown on the bottom right. 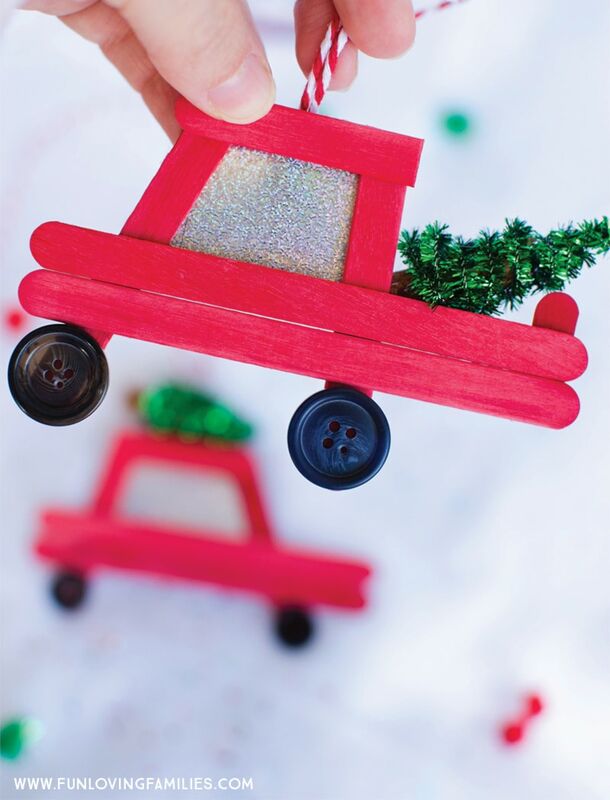 Tie the ends of a small piece of twine to make a loop, then hot glue the knotted end to the back of the ornament to make your ornament hanger. 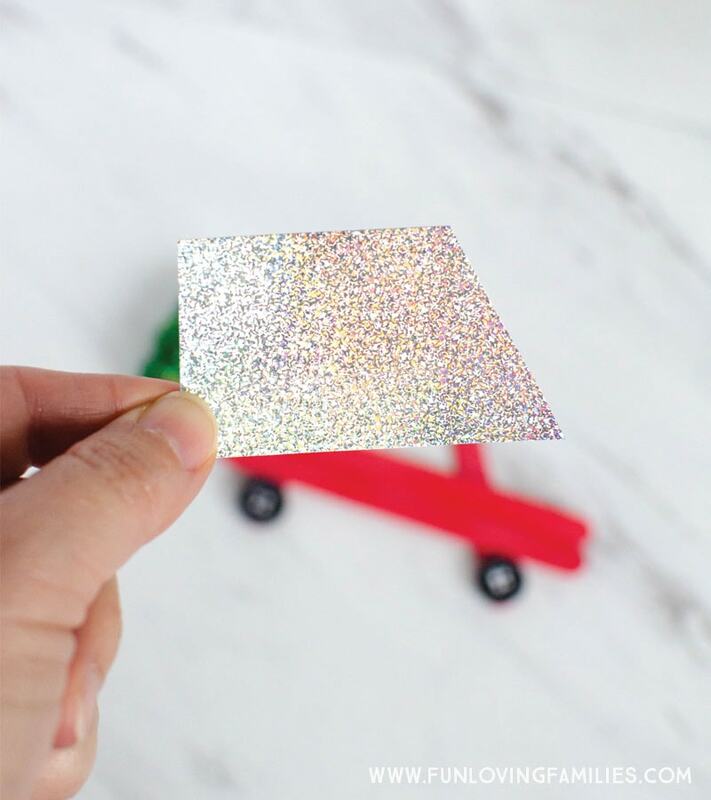 In the instructions, I used glitter paper for the windows. But, after my family goes on our trip to a tree farm, I plan on putting a photo from our outing into one of these ornaments to keep as a special keepsake ornament. I will also likely add the year somewhere on the ornament. The photo below shows how it will look, but this is not my family. 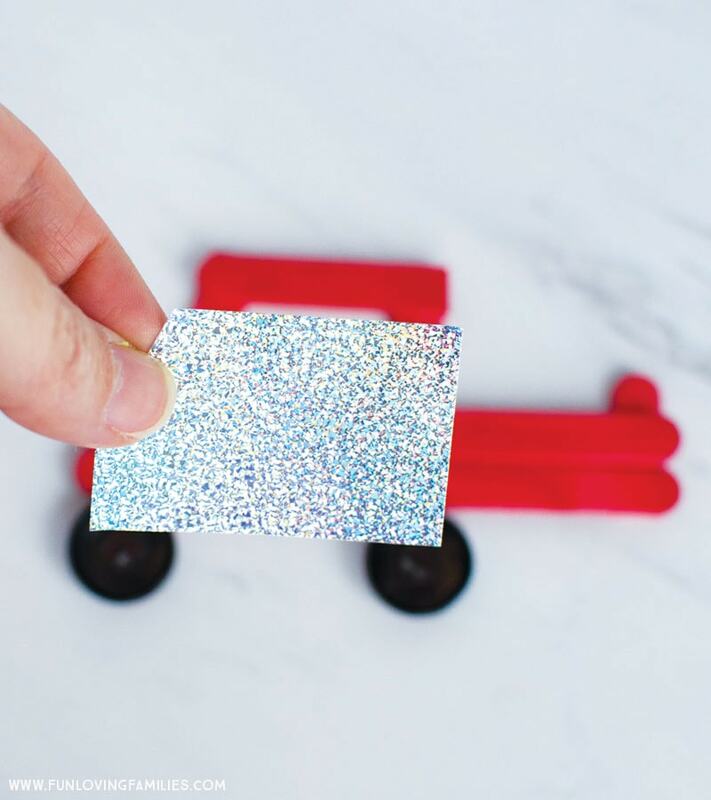 I used a stock photo in order to respect my kids’ privacy (and the fact that I don’t actually have the photo that I’m going to use yet!). 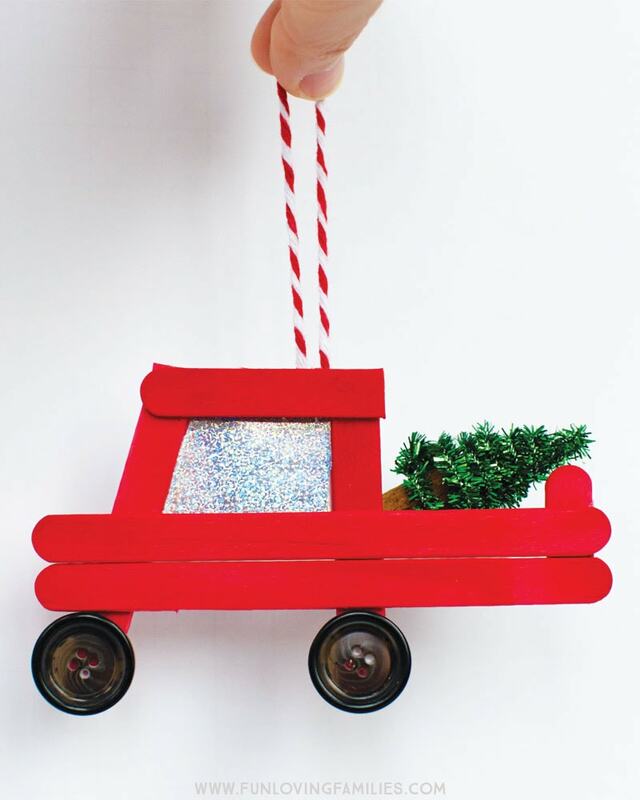 Have fun making or Christmas car and truck popsicle stick ornaments! 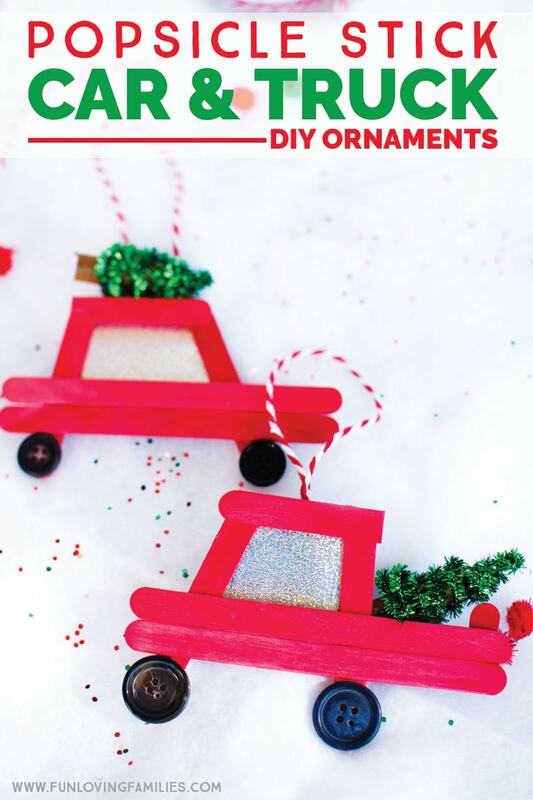 Be sure to also check out this list of 25 DIY Popsicle Stick Ornaments you can make with your kids this holiday season! 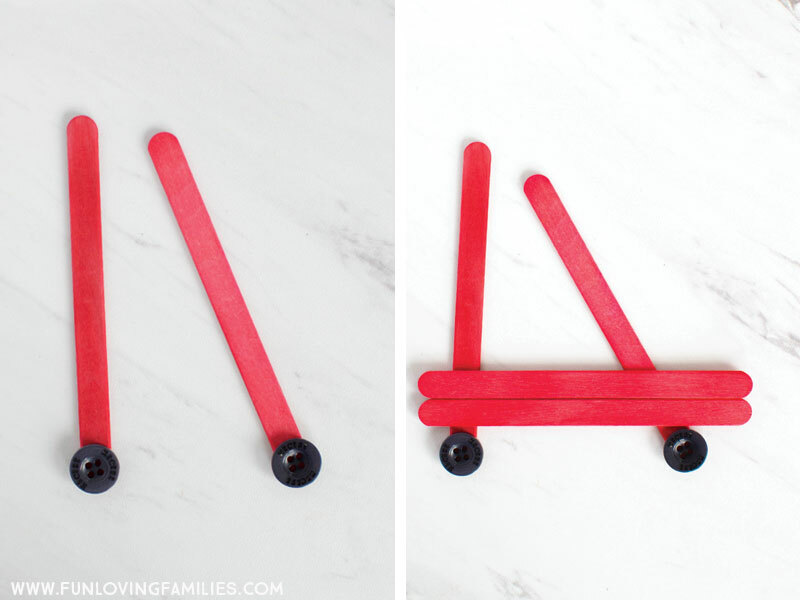 Did you use regular popsicle sticks or the large ones? I just used the regular sized popsicle sticks. Let me know if you have any other questions! These are adorable! Perfect idea for my 2nd grade students. Thank you. Love these! What size buttons do you suggest for the wheels?